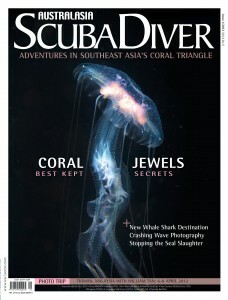 In this issue of Scuba Diver AustralAsia we head deeper into the most remote parts of the Coral Triangle, from East Timor to the Philippines and Indonesia. The triangle contains some of the least-explored areas of ocean paradise, where tantalising dives hide amazing new discoveries (“Adventures in the Coral Triangle,” page 42). Also in this edition, you’ll find stunning images from photographers who continue to raise the bar in digital excellence (see “Xtraordinary Dives,” page 22, and Mark Tipple’s portfolio, page 96). And finally, we open a new column dedicated to our talented readers and their photos (“Our Reader’s Shots,” on page 82), which can be as stunning as the pro’s. A fishing village puts the dark days of shark slaughter behind them, creating a new, if imperfect, relationship between animal and man. For many divers who dream of the world’s richest reefs, the Coral Triangle is the Holy Grail. For underwater photographers, the more darkness hides, the more it seems to reveal. An Australasian documentary film crew heads to Namibia to expose an unspeakable slaughter. Working to protect the world’s centre of marine biodiversity. From the most remote seas of the Coral Triangle, new fish species and unusual behaviours are revealed.